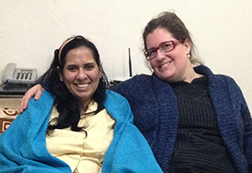 Michelle Fine and Irene Vince (from London) worked on organizing the Nek Chand Archive files and created mosaics for Phase III columns started by the October/November 2013 NCF volunteers. 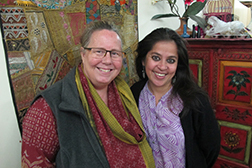 Michelle and Irene volunteered in the Rock Garden for 4-5 weeks in Nov-Dec 2013. 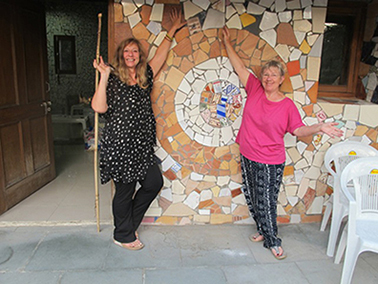 Left: Michelle and Irene posing in front of one of the many mosaics at Rock Garden. 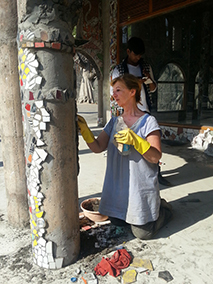 Right: Michelle working on column mosaic in Rock Garden Phase III (photo by Irene Vince). Sarah Davitt and myself, Christine Style, USA NCF Administrator, were at the Rock Garden for one week reviewing various volunteer needs, Rock Garden progress, and visiting with Nek Chand Ji. I am saddened to report that while the volunteers have made progress completing many mosaics at the Rock Garden over the years the general state of the Rock Garden is poor. 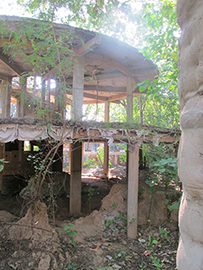 The ponds are filthy with algae and debris, the waterfall was not running, and the completion of Phase III and the museum started 6 years ago is still unfinished. The Nek Chand Rock Garden is the largest folk art environment in the world and is known by many throughout the world yet the government of Chandigarh treats it like an amusement park and has allowed the Rock Garden to stagnate. I hope that the NCF can work with the Rock Garden Society and the Chandigarh Administration to change this. Left: Sorting through Nek Chand Archives. 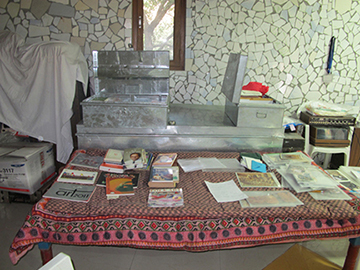 Volunteers Jan Lewin and Alan Cesarano started the work on the Nek Chand office archives in Feb-Mar 2013 and Irene continued with sorting in Nov-Dec 2013. My visit to Chandigarh’s Nek Chand Rock Garden brought me to one very clear goal. One of the most important things that the NCF can do to preserve the future of the Nek Chand Rock Garden is to help work for the Rock Garden to attain World Heritage status through UNESCO. We must all work together to make this happen. As NCF works for World Heritage status there will need to be more local support within India as well as without. 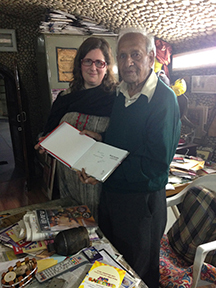 Minhazz Majumdar in New Dehli has agreed to help the NCF gain more support for this effort. 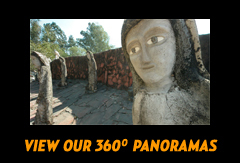 Alan Cesarano will come to the Chandigarh January through early March to create a short film about the Rock Garden and Nek Chand and to help spread the word about the needs of the Rock Garden and support for World Heritage status. All of this is in the beginning stages. 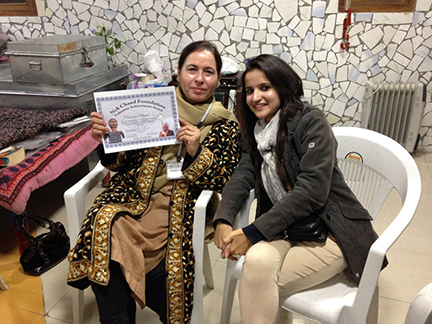 There is a growing group of volunteers within Chandigarh that have joined to help the International volunteers. This is excellent and much needed for NCF to continue and grow. Prof. Mani Dillon has led ‘Clean-Up Days’ at the Rock Garden for hundreds of school children and has had some of her college-age students volunteer at the Rock Garden with the International volunteers. Thank you Prof. Mani. Prof Mani with Itika and a Nek Chand Foundation (NCF) Certificate of Appreciation. Itika arranged for the food tifins to be brought in for lunch in the Rock Garden for the volunteers.